We are planning special Shabbats in the months to come. Mah jongg lessons will be given. No betting or money will be exchanged. You can participate in any or all of these activities. Next Cholentfest will be on Saturday, February 23, 2019. This time we will make one Cholent with only Flanken; this will be called the “Chazin Cholent”. combination of Flanken and lamb and beef sausage. 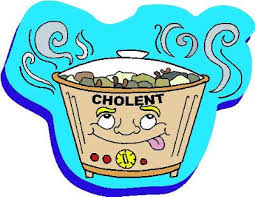 If anyone has a need for vegetarian cholent, let me know. This time we will also have board games available in case anyone wants to spend the afternoon. Jacob and how it affected history. what unifies all Jews —Shabbat! Everyone is invited… singles, couples, families—all ages. That’s the magic of Shabbat Across America and Shabbat Across Canada. By participating in this continent-wide event, you will not only have the opportunity to experience Shabbat, but you will be sharing your experience with tens of thousands of Jews across North America. No matter what your affiliation or which Shabbat Across America or Shabbat Across Canada location you choose to attend, NJOP’s (National Jewish Outreach Program) annual Shabbat program will give you a “taste” of Shabbat. Explanatory services, traditional rituals, delicious meals and lively discussions are all important components of the Shabbat experience, as well as the opportunity to spend the evening with like-minded people, friends and family. Shabbat Across America or Shabbat Across Canada is for everyone!!! Join us and bring a friend!!! Dinner is at 6:00 pm with services to follow at 7:00. We will eat, sing, learn and have fun!!!!! then A Night of Study at 9 pm. Cheesecake and Wine!